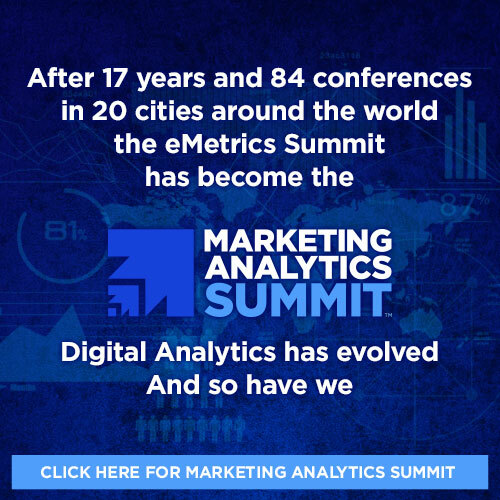 We will occasionally send you information on eMetrics Summit and/or other related events or products. This Web site contains links to other sites that are not owned or controlled by eMetrics Summit. Please be aware that we are not responsible for the privacy practices of such other sites. If you have any questions about security on our Web site, you can send email us at enquiries@emetrics.org. In the event eMetrics Summit goes through a business transition, such as a merger, acquisition by another company, or sale of all or a portion of its assets, your personally identifiable information will likely be among the assets transferred. You will be notified via email of any such change in ownership or control of your personal information.